So the Christmas season is in full swing, and that means it's time to buy gifts. Generally I like to be thrifty, maybe get someone an interesting book. For instance: Maybe James's newly acquired Mouse Guard RPG book mysteriously vanishes, and when Christmas rolls around, BOOM - Christmas miracle, I "bought" a "new" copy for him. Anyway, as the person who manages the internet around here, I have an acute awareness of what is selling well online. 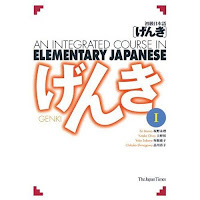 And our biggest holiday seller - that is, the book we are selling like hotcakes online right now - is this, the Genki 1 Elementary Japanese textbook. It may be pure coincidence, but more than half the books we've sold this week online have been this book. Also strange? Half of them were going overseas. I guess the gift teaching yourself Japanese is in this year. So whether you're celebrating Christmas, Chanukah, Kwanzaa, the Emperor's Birthday, or anything else (as long as it's not "Dowhateveryouwannikah," because those Gap commercials are pretty much the worst thing ever), give that special someone a gift that says "I think you might be more interesting if you tried to learn Japanese."